Completed Commercial Flat Roofing Project at the Bothell Library in Bothell, Washington. After many hours of hard work by Multifacet’s expert installers, we finished the installation of the Sarnafil PVC single ply membrane roofing system on the Bothell Library. Here at Multifacet, we only use the highest-quality and most trusted products on each and every project we do. For this reason, we select Sarnafil PVC single ply membrane to replace the Bothell Library’s old, failing EPDM single ply membrane roofing system. Sarnafil roofing and waterproofing membranes use only premium ingredients along with the ideal blend to produce the highest quality, longest lasting thermoplastic membranes in the industry. Below view a video showing the Bothell Library re-roof project in the in-progress stage and the completed Sarnafil PVC single ply membrane roofing system. A big thanks to Wetherholt and Associates, Inc, our consultant on this project and to the King County Library Systems for selecting Multifacet as their trusted commercial roofing contractor. We look forward to a long future with both partners and Multifacet happily adds another satisfied commercial roofing customer in the Pacific Northwest. Interested in choosing Multifacet as your trusted commercial roofing contractor? Photos and Video by Summit Videography. Aerial shot of the city of Bothell, Washington. Multifacet was pleased to be selected by the King County Library Systems to be the trusted flat roofing contractor for the Bothell Library. When we first came out to inspect the building, the EPDM single ply roofing system was failing in areas and putting the entire building at risk. In partnership with our consultant on this project, Wetherholt and Associates, Inc, we put together a plan to repair the Bothell Library’s roof with Sarnafil PVC single ply membrane roofing. With the plan in place, our team of expert roofing technicians got to work removing the worn EPDM single ply membrane roofing sections which were no longer protecting the library from the elements. Here at Multifacet, we only use the best roofing products on the market to ensure each of our customer’s home/building is properly protected for years to come. For the Bothell Library, we installed Sarnafil PVC single ply membrane roofing which will properly protect the building from the often harsh Washington weather for years to come. Multifacet happily continues our partnership with King County Library Systems as their trusted commercial roofing contractor for libraries and other facilities throughout the Pacific Northwest. 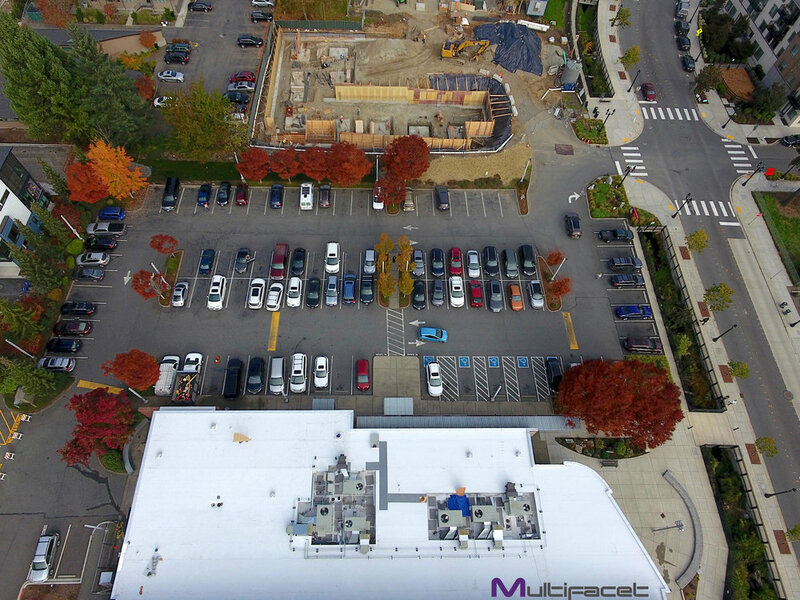 Check back soon for photos and an aerial video of the completed project for the Bothell Library. Check back soon to see photos and an aerial video of the finished project! Multifacet was pleased to be selected to design a custom home in Seattle. As highly experienced architects, we design and build custom home all throughout the Pacific Northwest. From the ground up, we designed and built this Seattle couple's dream home from start to finish. We first met with the property owners to discuss their vision for their Seattle home. Once the preliminary discussion with the property owners was complete, we began the design process. Our background in architecture makes Multifacet very unique from other contractors as we can provide custom design home builds from inception to completion. After a few rounds of reviews with the property owners, a final design for this couple's new home was approved! Our expert technicians at Multifacet then got to work making this custom designed home a reality. Here see photos of this Seattle custom home design in the many different phases of the project. 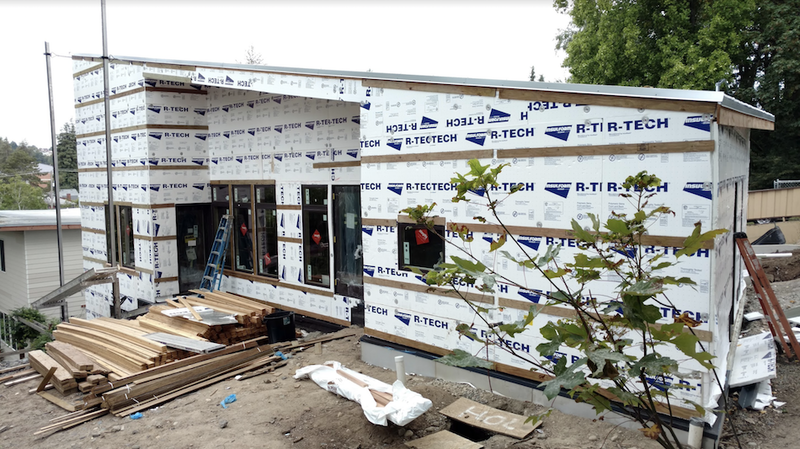 From pouring the foundation to framing to installing the subflooring and walls of the home to adding the finishing touches to the new home, our expert technicians at Multifacet were there through each step of the process providing expert workmanship. Multifacet happily adds another satisfied custom home build customer in the Pacific Northwest. Interested in choosing Multifacet as your trusted custom home building contractor? Multifacet was proud to be chosen as the trusted roofing contractor for the Olive Crest office building in Bellevue, Washington. Recently our crew of expert technicians went to the office building and performed a site inspection of the flat roofing system and the other components of the building. Below see photos of the roof covered in debris from Western Washington's harsh winter weather. After our expert technicians inspected the flat roofing system, we reported back to the building owners the recommended maintenance for their roofing system. Roof maintenance for a commercial building of this size is absolutely essential for maintaining the safety and integrity of a flat roofing system. Keeping vents and ducting clean and clear of debris helps eliminate issues for the building before they even arise. Our expert technicians then went back out to the office building in Bellevue and cleaned the entire roof and performed the needed maintenance to ensure the safety of the building for years to come. We are so pleased to add another satisfied commercial roofing customer in the Pacific Northwest. Multifacet was pleased to be contacted to inspect the roofing systems on the units in an Issaquah Retirement Condominium Complex. 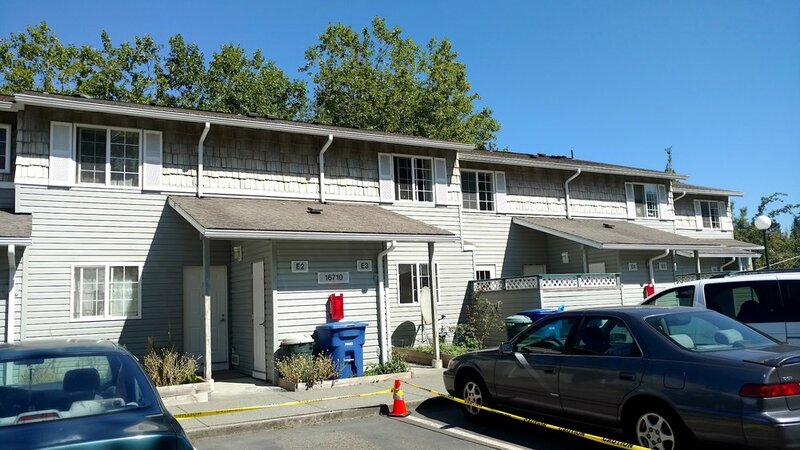 Our expert inspectors came out to this retirement condominium complex in Issaquah to assess the condition of the roofing systems. We found that most the units had a solid asphalt shingle roofing systems which were properly protecting the homes from the elements. Though we did find one unit which had issues involving the flashing on the roof and recommended that we repair the flashing to ensure the integrity of the whole roofing system. This is a common issue that occurs in roof maintenance. Roof flashing refers to sheet metal installed at any breaks, joints or edges on your roof to prevent leaks. Our expert technicians then began replacing the flashing with new aluminum metal. The property owners were very pleased with our thorough roof inspection services and maintentance and repair. They let us know when any other issues arise in the future on these condos, we will be the first company they call. 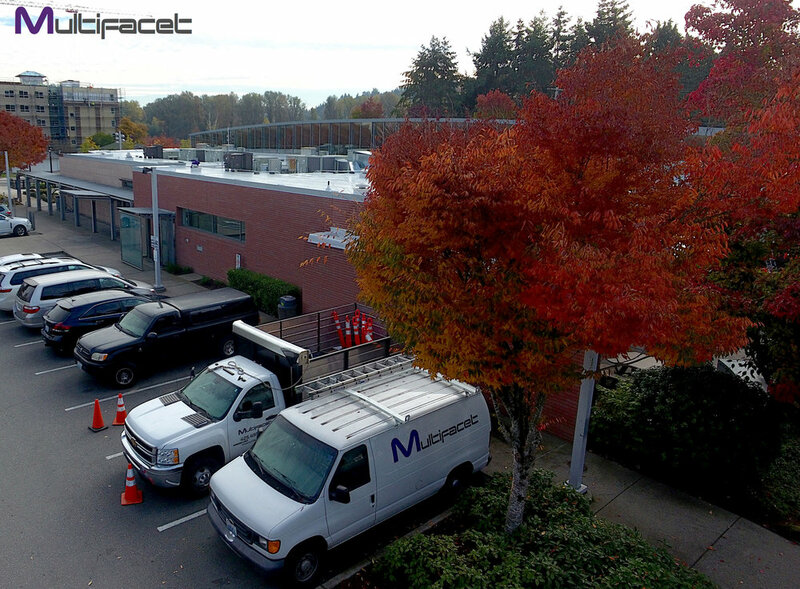 Multifacet happily adds another satisfied Multifamily Roof Inspection customer in Issaquah, Washington. Interested in choosing Multifacet as your trusted residential asphalt shingle roofing contractor? Multifacet was pleased to be selected as the trusted multifamily roofing contractor by the property managers at Green Leaf Skyline Apartments in Kent, Washington. 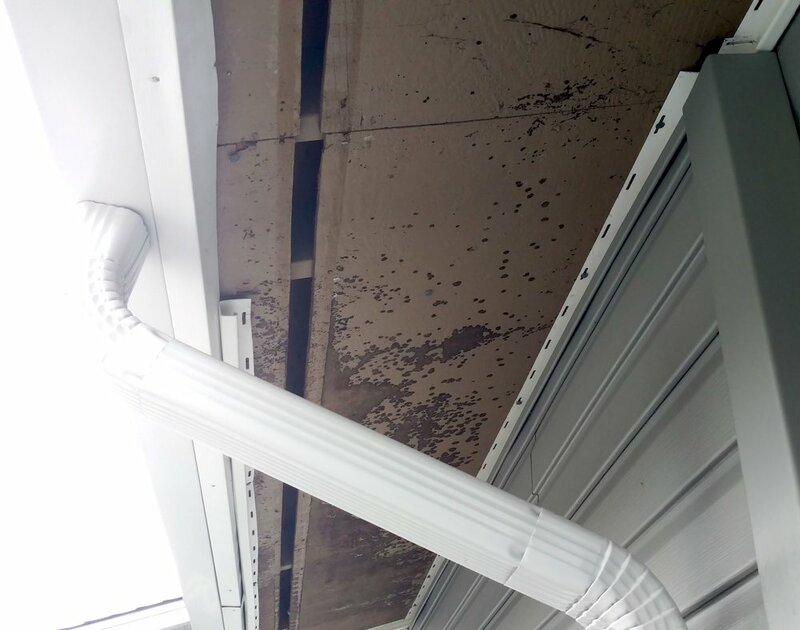 The property managers first reached out to us because in three of the units the existing roofing systems were leaking and failing to properly protect the tenants. We came out and inspected the roofs and found that the existing roofing systems on the buildings were old and worn so we recommended a full asphalt shingle reroof for each of the three units. Our expert technicians came out and began removing the old, worn asphalt shingle roof and all the underlayment as well. Then they installed all brand new plywood and underlayment on each of the three units. Once the proper foundation was laid for the roofing system, they began installing the new Malarkey Northwest XL asphalt shingle roofing system. For the new Malarkey Northwest XL asphalt shingle roofing system, the property managers selected grey for the new shingle color to match the exterior color palette of the buildings at the Green Leaf Skyline Apartments in Kent. The new roofing systems greatly enhance the visual appeal of the apartments as well as will offer years of excellent protection for the tenants. Multifacet happily adds another satisfied multifamily asphalt shingle roofing customer in the Pacific Northwest. Interested in choosing Multifacet as your trusted multifamily residential asphalt shingle roofing contractor? When Multifacet's expert technicians aren't servicing our valued customers, they are training and learning the proper installation techniques from our top-tier product manufacturers like Malarkey, PABCO, James Hardie, itekEnergy, GACO, and many others. Recently our trusted manufacturer partner, CertainTeed came to our office in Bellevue to demonstrate and train our expert installers on their self-adhering SBS Modified Bitumen Roof System, Flintlastic® SA. CertainTeed Flintlastic® SA roofing membrane is a premium, self-adhering SBS modified bitumen roofing material suitable for use in accordance with CertainTeed specifications for most low-slope roof system applications. Flintlastic SA Cap is available in 8 colors, plus white and CoolStar highly reflective granules. Flintlastic SA Cap white meets or exceeds ENERGY STAR® requirements for slopes greater than 2:12". Our CertainTeed rep demonstrated exactly how simple and efficient installing Flintlastic® SA is compared to other types of SBS modified bitumen roofing systems. Our technicians learned step by step the proper installation techniques for this type of low slope roofing system. With the manufacturer rep right there our technicians were able to ask questions as the demonstration was being given to ensure by the end of the training they would be able to expertly install an entire Flintlastic® SA roofing system on a low slope roof. Here at Multifacet, one of the core principals of our company mission is to ensure we are always providing the most excellent service to each and every customer whether the project is a residential asphalt shingle reroof or a large-scale low slope reroof on a commercial building. The key to upholding this core principle is through constant education for each our expert technicians through training seminars just like the one you saw from CertainTeed here. We hope the next time you are looking for a contractor in the Pacific Northwest you will consider choosing Multifacet. Interested in choosing Multifacet as your trusted contractor? Multifacet was pleased to be selected by these Mercer Island homeowners as their trusted residential roofing contractor. We first came out to their lovely Mercer Island home and assessed the condition of the existing roofing system. We found that the existing asphalt shingle roofing system was greatly worn and beginning to fail in properly protecting the home from the harsh weather West Washington can often bring upon homes. From our inspection, we recommended a full residential reroof to the homeowners. Our expert technicians first began by removing the old worn asphalt shingle roof and all the underlayment and plywood that was worn and failing to properly protect the interior of the home. Once all of the old roofing materials were removed, we installed brand new plywood and underlayment before beginning to install the new asphalt shingle roofing on top. Secure and properly installed underlayment is essential for the longevity and security of your roofing system because it is the foundation in which the roof is built upon. Improperly installed underlayment can often shorten the lifetime of the roofing system and put the home at risk of premature leaking. Once the underlayment was installed by our expertly trained and certified technicians, they began installing the brand new asphalt shingle roofing system. With the homeowners, we chose to install a new CertainTeed Presidential Shake® TL asphalt shingle roof. The homeowners loved the look of their new Presidential roof because these luxury shingles have the look of cedar shakes with the performance of one of the finest composition roofing solutions in the industry. The Presidential Shake® roof is a triple laminate shingle with three layers of material for the industry's thickest, toughest and heaviest shingle. The sculpted tabs provide the look and beauty of old world wood shake but with better performance and at a fraction of the cost. The homeowners chose to go with the color Country Gray for their new roof. As you can see in the pictures above the color of the new roof perfectly compliments the neutral color palette of the home's exterior. In addition to greatly enhancing the visual appeal of the home, these Mercer Island homeowners can rest easy night after night knowing their home will be protected for years to come. Multifacet happily adds another satisfied residential roofing customer in the Pacific Northwest. Multifacet is highly dedicated to providing the highest level of customer service to ensure every customer has the best possible experience when they select us as their contractor. From commercial roofing to siding to exterior or interior painting to solar, our technicians are each highly trained and experienced so our customers can be confident in our recommended services for their home or building. Providing the highest level of customer service on every project no matter how large or small the scope of the work has served us well in building lasting relationships with returning customers year after year. Though you do not have to take our word for it, below read what some of our valued customers had to say about Multifacet and workmanship we have provided them. If you are one of Multifacet's valued customers and would like to leave us a review, please click the button below. We so appreciate you taking the time to leave us feedback! Interested in receiving a free estimate on your project from Multifacet? Multifacet was very pleased to be selected as the trusted roofing contractor to replace the roof on the Des Moines Field House Parks and Recreation Office in Des Moines, Washington. We first went out to the site to assess the condition of the existing roof and found that it was greatly worn and even had moss growing on the existing shingles in some places on the roof. We recommended a full asphalt shingle roofing system to replace the worn, aged roof. First, our expert technicians began by removing the existing asphalt shingle roofing and plywood. We then replaced all the worn out plywood and underlayment with brand new materials. Laying a proper foundation for an asphalt roofing system is absolutely essential to guarantee the new roofing system will be able to protect the structure for the full lifetime of the roof. After the new underlayment and plywood were installed on the roof, we installed a brand new CertainTeed Presidential Shake® TL asphalt shingle roof. Presidential Shakes are CertainTeed's luxury shingles with the look of cedar shakes and the performance of one of the finest composition roofing solutions in the industry. Three layers of material for the industry's thickest, toughest and heaviest shingle. The sculpted tabs provide the look and beauty of old world wood shake but with better performance and at a fraction of the cost. While installing the new asphalt shingle roofing system we also performed an inspection of the attic to ensure it was properly insulated. The new CertainTeed asphalt shingle roofing system will offer the highest level of protection for the Des Moines Field House Parks and Recreation Office for years to come. The new roofing system also greatly enhances the visual appeal of the building. Multifacet happily adds another satisfied asphalt shingle reroof customer in the Pacific Northwest. Interested in choosing Multifacet as your trusted asphalt shingle roofing contractor? Here at Multifacet, we are dedicated to providing the highest level of customer service to ensure every customer has the best possible experience when they select us as their contractor. From commercial roofing to siding to exterior or interior painting to solar, our technicians are each highly trained and experienced so our customers can be confident in our recommended services for their home or building. Providing the highest level of customer service on every project no matter how large or small the scope of the work has served us well in building lasting relationships with returning customers year after year. But you don't have to take our word for it, below read what our valued customers had to say about Multifacet. Multifacet was pleased to be selected by these Bellevue homeowners to re-coat their deck overlooking the city. We first came out to assess the condition of the deck and make sure the structural integrity was secure on the deck. Upon inspection, we found the deck was secure and was just in need of new coating to increase visual appeal and waterproof it. We recommended re-coating the deck using Gaco Western's GacoDeck. GacoDeck® is a water-borne, single component waterproof deck system that can be applied over plywood, concrete, metal, fiberglass and previously coated decks. The coating is designed to create a fully adhered, durable waterproof membrane that expands and contracts along with the substrate. The homeowners agreed and our technicians got to work prepping the home's deck and then applying the GacoDeck®. As you can see from the photos below the new white GacoDeck® coating turned out beautifully on this Bellevue home's deck. Now the homeowner's outdoor living space will be properly waterproofed and protected from the element for years to come as well as the aesthetic of the deck's appearance is greatly enhanced by the GacoDeck® coating we applied. Multifacet happily adds another satisfied residential deck coating customer in the Pacific Northwest. Interested in choosing Multifacet as your trusted residential deck coating contractor? Multifacet was proudly selected by the property managers of the Rainier View Apartments in Cle Elum, Washington as their trusted multifamily roofing contractor. We first came out to assess the condition of the roof on two units which had leaks and were starting to fail in properly protecting the units and tenants from the weather. After our expert technicians inspected the roofs of the two units with leaks, we inspected the roofs of the other four units in the complex. 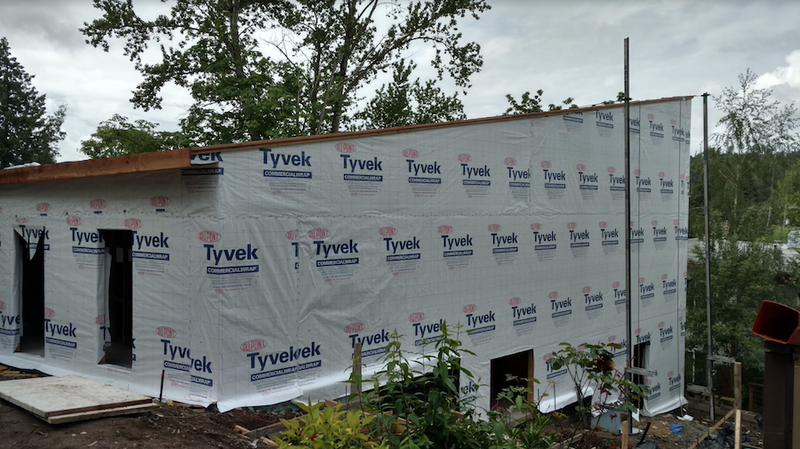 We found that each of the six units had an old, worn shingle roof that could no longer properly protect the structure from the often harsh rain and weather conditions the Pacific Northwest can bring. For this reason, we recommended a complete reroof of all six buildings in the Rainier View Apartments in Cle Elum, Washington. The Rainier View Apartments in Cle Elum, Washington before the re-roof. Our expert technicians began by removing all the old, worn asphalt shingle roofing on all 6 units of the complex. Then we began the process of installing the new asphalt shingle roofing system. Arguably the most important part of a residential roofing system is making sure a secure and reliable foundation is laid first for the roof. Our expert roofing technicians replaced all the plywood and then installed Titanium UDL synthetic underlayment to create the most secure foundation for the new asphalt shingle roof to be laid on top of. After the underlayment was completed, we installed the brand new asphalt shingle roofing system on each of the six units of the Rainier View Apartments. After the new asphalt shingle roofing system was installed. Above you can see the difference in the curb appeal the new asphalt shingle roofing system brought to the apartment complex. In addition to greatly enhancing the visual appeal of the apartments, all six units will now be properly protected from the weather for years to come and the tenants and property managers can rest easy. Multifacet happily adds another satisfied multifamily re-roof customer in the Pacific Northwest. Interested in choosing Multifacet as your trusted multi-family roofing contractor? Here at Multifacet, we are always striving to improve our customer service to ensure every customer has the best possible experience when they choose us as their contractor. From commercial roofing to siding to exterior or interior painting to solar, our technicians are each highly trained and experienced so our customers can be confident in our recommended services for their home or building. Providing the highest level of customer service on every project no matter how large or small the scope of the work has served us well in building lasting relationships with returning customers year after year. But you don't have to take our word for it, below read what our valued customers had to say about Multifacet. Multifacet was pleased to be selected by these valued Seattle homeowners for a residential siding and exterior painting project. We first went out to assess the condition of the home's existing siding and we found it was greatly deteriorating and in need of being fully replaced to properly protect the home. For this reason, we recommended a complete residing of this beautiful Seattle home. Our expert technicians first removed all the old, worn siding and replaced it with brand new, top of the line siding to properly protect the home from the elements for years to come. After the new siding was installed the homeowners selected a brilliant canary yellow as the exterior paint color for the newly sided home. We painted the entire exterior of the home after the siding was installed. As you can see in the above photos, the new siding and exterior paint greatly enhances the curb appeal of this Seattle home. The homeowners were very pleased with our professionalism, punctuality and attention to detail in our workmanship on this project. Multifacet happily adds another satisfied customer in the Pacific Northwest! Interested in choosing Multifacet as your trusted multifamily siding contractor? Here at Multifacet, we are constantly improving our customer service to ensure every customer has the best possible experience when they choose us as their contractor. From roofing to custom design builds to exterior or interior painting to solar, our technicians are each highly trained and experienced so our customers can be confident in our recommended services for their home or building. Providing excellent customer service on every project no matter how large or small the scope of the work has served us well in building lasting relationships with returning customers year after year. But you don't have to take our word for it, below read what our valued customers had to say about Multifacet. Here at Multifacet, we pride ourselves on our excellent workmanship and extensive experience in the industry of construction. Over the years, we have had the privilege of being chosen to design and build many homes and buildings across the Pacific Northwest. Recently, an Ocean Shores property owner reached out to us to design and construct a custom yurt and cabin looking out over the coastline into the beautiful Pacific Ocean. We met with the Ocean Shores property owners and discussed design ideas and practical usability for the structures. The final design which was chosen was a small cedar shake cabin with a conjoining yurt. Our expert technicians began the full construction of the new shake cabin and yurt and before we knew it the structures were complete. What the yurt and cabin lack in square footage they make up for in unique-design and overall aesthetic appeal. The cabin and yurt both have an outstanding view of the Pacific Ocean which transports the occupants back in time when the Oregon/ Washington Coast was unexplored territory. Both the yurt and cabin were also specifically designed for wind and rain durability because of such close proximity to the coastline. These Ocean Shores property owners now happily have a secluded coastal forest getaway to enjoy the beauty of the natural Pacific Northwest from the comforts of their custom designed cabin and yurt. Multifacet happily adds another satisfied design-build customer in the Pacific Northwest! Interested in choosing Multifacet as your trusted design build contractor? As a company, we always strive for excellence in our workmanship and customer service. It is of the highest importance to every member of our team that each of our customers is completely satisfied with the work we performed and the experience they had. Providing excellent customer service on every project no matter how large or small the scope of the work has served us well in building lasting relationships with returning customers year after year. But you don't have to take our word for it, below read what our valued customers had to say about Multifacet.